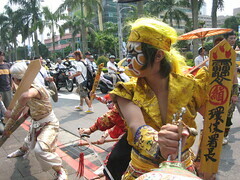 Taiwanese environmental groups held their second Pudu (普渡) ceremony yesterday (the 14th day of the Seventh Month of the Lunar Calendar, or 14 August) in front of the Executive and Control branches of the government. We are currently in the middle of ghost month, when the gates of hell are opened and all manner of other worldly creatures roam the realms of humans. 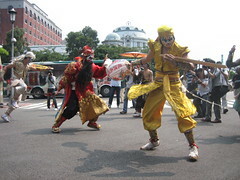 Last year's demonstration featuring Taoist priests and two days of incantations was held during the ghost month (seventh month of the lunar calendar) in front of Taiwan’s Environmental Protection Administration in downtown Taipei. This year the venue was changed to the Control Yuan, the arm of the five-branch (Yuan) government charged with investigating corruption and mismanagement by government officials. The Executive Branch, right across the street from the Control Yuan was the starting point for a band of Taoist ghost busters, eliciting warnings from the somewhat puzzled police for holding an unregistered demonstration. 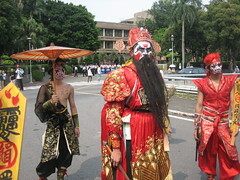 The troupe ignored the warnings and slowly slinked across the boulevard and performed exorcism rites on Taiwan’s Basic Environment Act, to see whether it might have a chance to gain some life from the newly appointed members of the Control Yuan. The main participants in this year’s rites were a group of about 40 residents of the central-western Taiwanese coastal city of Lukang, the city that turned away Dupont’s bid to build a titanium oxide plant some 23 years ago. Led by Nian Hsilin, this year the residents were gathered to deliver a petition to the Control Yuan excoriating our EPA for having twisted laws and regulations relating to a plan for two coal fired power stations in nearby Changhua that would have total generation capacity of 1,600 Mw. 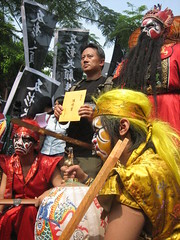 Other groups joining the Changhua Anti-Coal Plant Coalition in the festivities were Green Party Taiwan, United Tianmu, and Wild at Heart Legal Defense Association.